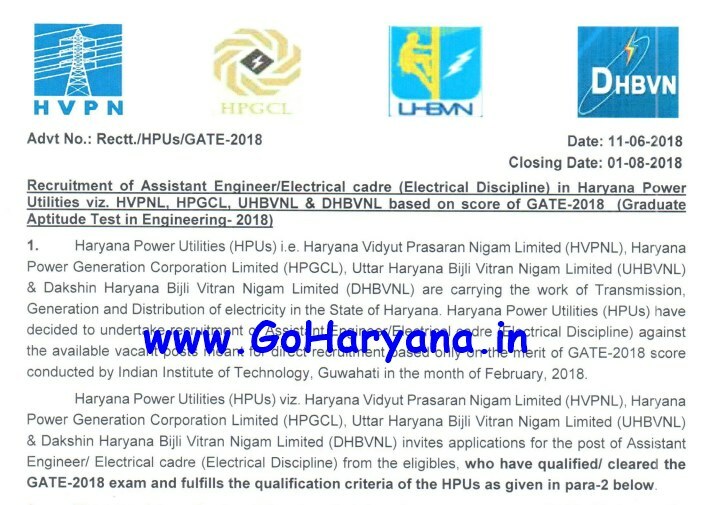 HPUs Recruitmant 2018 - Haryana Power Utilities (HPUs) i.e. 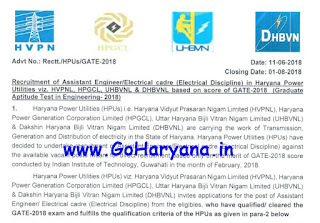 Haryana Vidyut Prasaran Nigam Limited (HVPNL), Haryana Power Generation Corporation Limited (HPGCL), Uttar Haryana Bijli Vitran Nigam Limited (UHBVNL) and Dakshin Haryana Bijli Vitran Nigam Limited (DHBVNL) has released the recruitment notification for the post of Assistant Engineer/Electrical Cadre (Electrical Discipline) against the available vacant posts meant for direct recruitment based only on the merit of GATE-2018 score conducting by IIT, Guwahati. Age Limit: Candidates age should be 20 - 42 years as on 01-08-2018. (a) Hindi/Sanskrit upto Matric standard or Higher educations. (i) Electrical/Electrical or Electronics Engineering. (c) Must have cleared GATE-2018. Application Fee: The Application fees is to be paid online through digitally i.e. Debit Card/Credit Card/ Net-Banking. How To Apply: Interested & Eligible Candidates can apply online through www.hvpn.org.in , www.hpgcl.org.in , www.uhbvn.org.in or www.dhbvn.org.in from 18-06-2018 by 10:00 AM to 01-08-2018 by 11:59 PM. Starting Date to Apply - 18/06/2018 by 10:00 am. Last Date to Apply - 01/08/2018 by 11:59 pm.